The TNG staff in collaboration with the INAF-IAPS Roma, Univ. 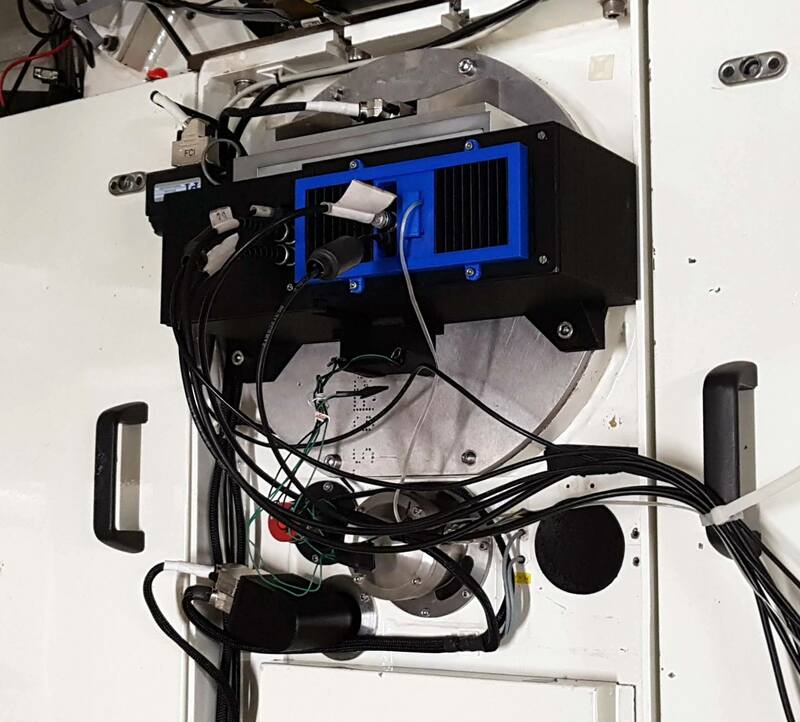 of La Sapienza, INAF- Rome Astronomical Observatory and the University of Catania successfully obtained the first light for the new improved version of the Silicon Fast Astronomical Photometer and Polarizer (SiFAP2). The Pulsar of the Crab Nebula (M1) and several other objects have been observed with SiFAP2 mounted as Visiting Instrument at the Nasmyth-A F/11 focal plane of the Telescopio Nazionale Galileo on the night of Nov, 14th 2018. SiFAP2 allows for fast timing detection of variable objects at sampling of up to 25 nanoseconds thanks to a custom readout electronics developed by F. Ambrosino and F. Meddi at La Sapienza. The previous version of the photometer (SiFAP) has already shown its capabilities at the TNG allowing the First detection of optical pulsations from a transitional ms pulsar (F. Ambrosino, A. Papitto, L. Stella et al. Nature Astronomy 1, 854, 2017). The new improved version of the optomechanical system, developed at the FGG by A.Ghedina and the FGG Technology and IT Divisions, in collaboration with F.Leone from Univ. of Catania, gives more versatility to the photometer and a new polarimetric observing mode. Three MPPCs from Hamamatsu with ~50 arcsec2 FoV receive the light from the TNG and can observe the target and a reference star in simple photometry or with linear and circular polarimetry. The system allows for easier pointing on the sky and fast switch between the observing modes. A set of Johnson and Sloan broadband filters is also available. The system is described in “SiFAP2: a new versatile configuration at the TNG for the MPPC based photometer” A. Ghedina, F. Leone, F. Ambrosino et al. ,SPIE proc. 107025Q (2018). The capabilities of SiFAP2 clearly show the opportunity to consider it as a niche instrument for Time Domain Astronomy. The TNG staff is evaluating both the option to use SiFAP2 as follow-up and the possibility to offer it as PI instrument in the next calls. Illustration 1: SiFAP2 is installed at the direct F/11 Nasmyth focus of the TNG telescope and takes advantage of the previously mounted filter wheel of the decomissioned OIG. The detector used for Reference can be moved radially off-axis from the Target to cover a FoV between 3.6 and 8.3 arcmins into which search for the reference star. The position angle is changed by moving the derotator. 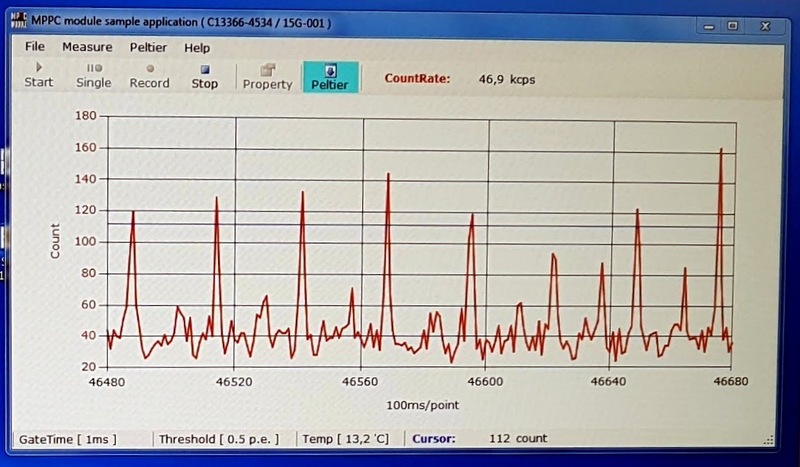 Illustration 2: A screenshot of the GUI of one of the MPPC with the real time counts of photons from the Crab Pulsar during first light of SiFAP2. The 20 seconds plot shows one point every 100ms with 1ms gate. 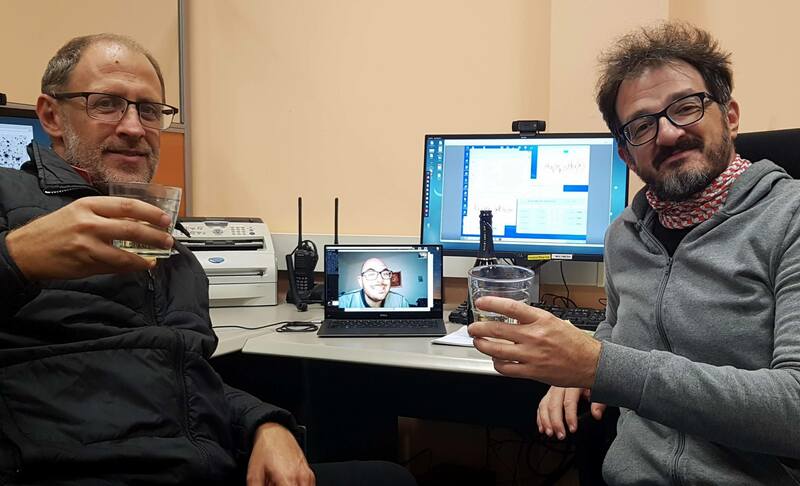 Illustration 3: Massimo Cecconi (left), Adriano Ghedina (right) and Filippo Ambrosino (remotely connected from Rome) celebrating the first light of SiFAP2 at the TNG. The two TNG observers had to cheers and drink also for F.Ambrosino, F.Meddi, A.Papitto, F.Leone and all the rest of the FGG staff who could not participate at the observing run.